While Graham Turner is careful to ensure that Studio 88's prints are of very high quality, nothing can compare with owning an original, whether it's a large scale oil on canvas, a smaller gouache painting, or a pencil drawing. 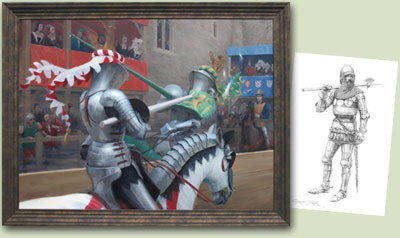 These are one-offs, painstakingly created by hand over many days, weeks and often months by Graham, each painting meticulously researched down to the finest detail, bringing to life the events and characters of our colourful and often turbulent past and earning him worldwide recognition for his work. Click on the section title or image on the left for details. 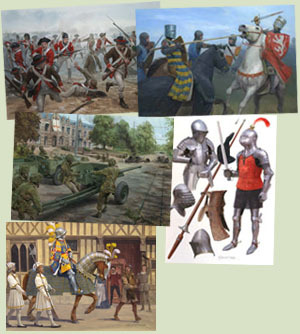 Since his first commission for Osprey Publishing back in 1996, Graham Turner has now provided paintings for over 60 books for this well known publishers of military books, covering historical periods from Ancient Rome, through the Middle Ages, Renaissance, the English Civil War, Napoleonic and Crimean Wars, to the First and Second World Wars. 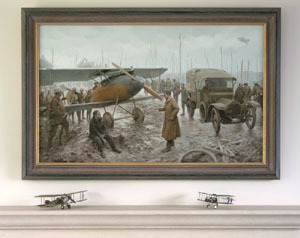 On publication the original paintings are returned to Graham for resale, and many have found new homes with collectors. 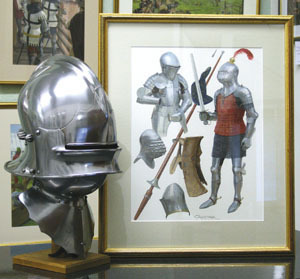 These paintings are priced considerably lower than Graham would usually charge, to take into account the fee that the publisher has paid for their use - a great opportunity to acquire a unique piece of original art by Graham Turner, a painting that is 'immortalised' in print. Paintings are organised into sections by historical period - click the section title or image on the left to start browsing.... Further information can also be found in this section about how to acquire one of Graham's original paintings for your wall - whether you want to buy online and have your painting shipped to you, or you'd like to arrange to visit us in Aylesbury and view the originals before making a final choice.